Oogst necklaces are a joy to wear everyday. Hand made in our studio in silver, white, rose or yellow gold. 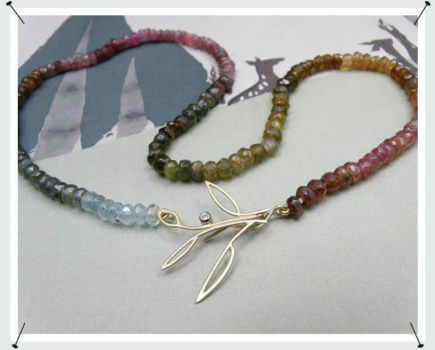 Choose a colourful necklace with sparkling gemstones or lustrous pearls with the emphasis on the hand made clasp. Or be seduced by our clean-cut links or a delicate chain that drapes elegantly around your neck. Our custom designed necklaces are made to impress and express! Do you want to complete your outfit with more unique and handmade jewellery? Be sure to check out the other accessoires like our collection of earrings, rings and bracelets. Feel inspired to make something unique with us? Make an appointment and we’ll see you in our studio!